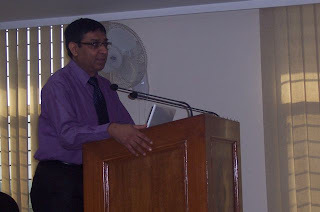 During my participation in ISBA in Feb 2010, Dr Paul, Dean at AKG College of Engg visited us and liked our designs and then invited us for a guest lecture at his college. 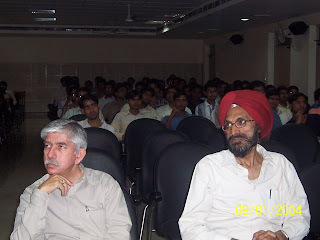 On March 12,2010, we visited AKG College of Engg at Ghaziabad on NH24.I It was around 20 kms Noida and had good infrastructure and a dedicated faculty. I spent around 30 minutes talking about myself, electronics and embedded and my favorite project Joy-n-Freedom. During Q&A there were no queries from students, however during the demo of our products, there were lot of queries. Students at AKGCE were really wonderful, intelligent and working on lot of new project. Only thing there (as well at most of other engg colleges) was lack of interaction with industry and they were working on old and obsolete technology. However I saw dedication and keen interest in students welfare in HOD, Electronics Mr Chopra's vision and plan. I am sure under his guidance, students of AKGEC will create wonderful results. My best wishes to faculty and students. I am also looking for closer interaction and more projects along with them. Swati Mehta and Pankaj Talwar assisted me in the presentation. As usual there were cheerful, happy and eager to work and do what ever is required without any issues. Very nice Sir. U r really looking Handsome in the pic. Very nice and too the point ppt.